I originally began this whole Farmers Market Tour Dinner thing as a way to get out of our dinner rut and try some new things and we certainly have done that. Along the way I have learned a lot about trying new recipes with kids. First, we now have "No Thank You Bite Rule" at our house (thanks to some awesome friends who shared this idea with me) the rule is that you don't have to eat it but you have to take a small bite before you can say no thank you to something. This rule has been super helpful in getting past the immediate response I normally get when I put something new on the table which is "I don't like this." The other big lesson I have learned is that most of the time trying new foods is all about marketing. They were not in to the idea of falafel but fancy chick burgers where a huge hit. However, with all I have learned this weeks Farmers Market Tour Dinner taught me the biggest lesson. Don't rush to make a new dinner on a night when everyone is tired and super hungry. Those are the nights to go with your old standby favorite. 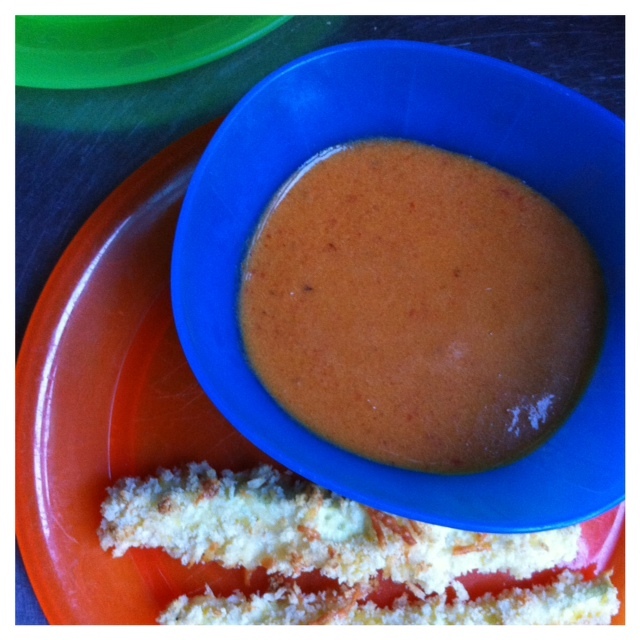 This week we tried a homemade roasted red pepper and tomato soup with a side of baked Parmesan zucchini sticks. Both of which were not met with the best reviews and the night ended with our littlest critics eating peanut butter sandwiches. However, I will say that I think this was mostly because it was late, they were tired and hungry and I was rushing around to get dinner on the table. So I will share the recipes this week because I think they actually were pretty good and probably would have been better received on anther night. 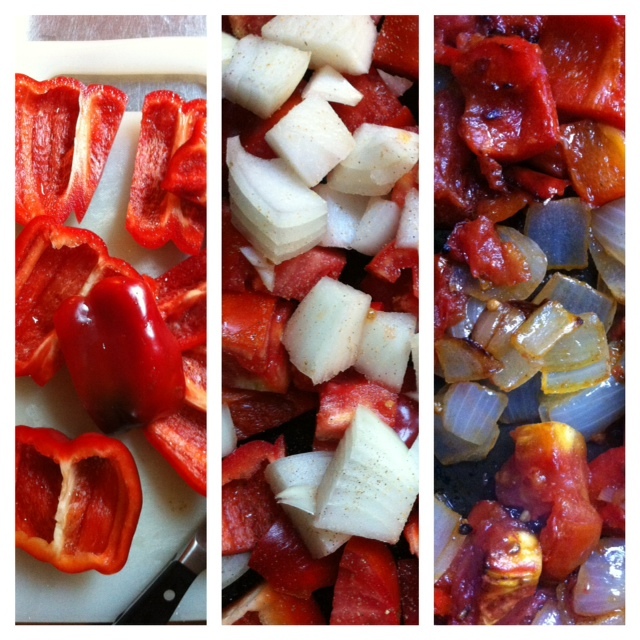 1) Slice 3 large red pepper, 3 large tomatoes and one small onion into chunks. 2) Sprinkle the vegetables with olive oil, salt, pepper and a little garlic powder and roast in a 400 degree oven for 45 minutes or until soft. 3) I then added the vegetables to a large soup pot, mixed in 4 cups of vegetable stock and simmered over medium-high heat for about 20 minutes. 5) After everything was fully blended I stirred in a cup of 1/2 and 1/2 and seasoned to taste. The soup was actually very good and while neither of the girls loved it the Bee did actually eat some of this. I think next time I will serve it with a grilled cheese and hopefully get better results. 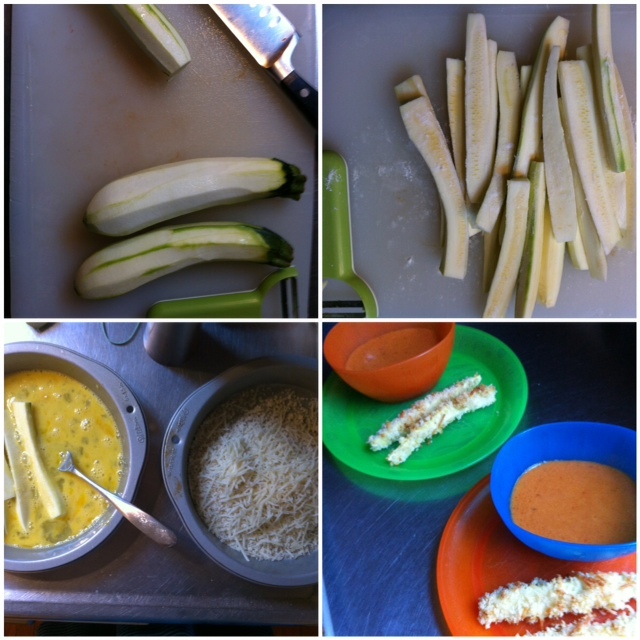 1) Wash and peel three small zucchini and then cut into long thin strips. 2) Use two pie pans, in one beat two eggs in the other mix enough panko bread crumbs to cover the pan, shredded Parmesan cheese and salt and pepper and toss to mix. 3) Dust the zucchini with flour and then dip into the egg and bread crumb mixtures until fully coated. Here is the mistake I made here, I was rushing and didn't leave them in the oven long enough so they were a little uncooked. After asking the girls several times to try them I finally tasted one and got it, they were definitely underdone. I think we will have to try these again too, just baked a little longer.